Members: Share your finds of roads less travelled or any place worth checking out, such as restaurants or businesses offering tours that could accommodate our group. Email Christine Toibin any and all of your ideas for any of these runs. Only those NORCAL MINIS' families that purchase a NORCAL MINIS' Membership can vote on Club activities! Become a Member today at www.norcalminis.com. Here's our plans for the Redding/Lassen Volcanic National Park weekend. We hope to see many of you as we enjoy this great National Park. An invitation has been been extended to Shasta MINIS & Capital City MINIS to join us as well. Come meet fellow club members for a fun weekend away. From here we’ll motor up to Redding via 505 & I5. Park Admission Includes admission to the Museum, Forest Camp, Parrot Playhouse, and Botanical Gardens. Enjoy the bridge and park as long as you want. It closes at 4pm. Check in to hotel and we’ll see you later in the evening at Benton AirPark. Come to the Benton Airpark for dinner at their cafe before the movie. The Cafe' closes at 7pm, so come early to have a bite to eat and hang out, or eat wherever you chose before movie time. We’ll see “The Italian Job” in an airplane hanger. Details: Enjoy FREE POPCORN. Beer, wine, and soda available for sale! Breakfast: Eat at your hotel or elsewhere before meeting for departure to park. 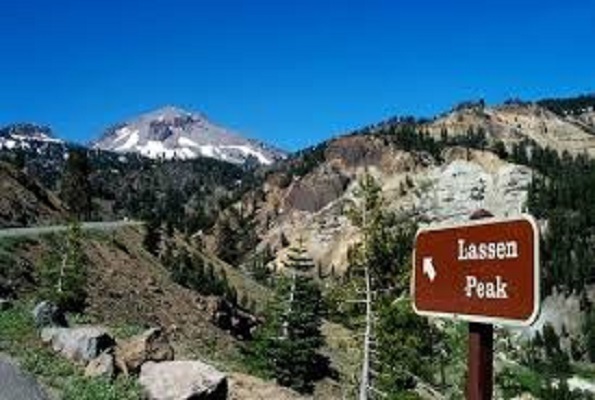 We’ll head to Lassen via Hwy 44 then 89, then 36 to Red Bluff before heading home. The drive through the park takes about two hours (with stops) from the Manzanita Lake entrance (Hwy 44) to the Hwy 36 entrance. Free for those of us with a Senior Pass - don’t forget to bring it! A good rule of thumb is that a pet may go anywhere a car may go: roads and road shoulders (not snow-covered), campgrounds, picnic areas, and parking lots. Pets are not permitted on any hiking trail, in the park backcountry (including snow-covered roads or trails), in any body of water, or inside visitor centers or other park facilities. Lunch: You can bring your own, or purchase from the Lassen Cafe & Gift or the Manzanita Lake Camper Store. We’ll have lunch together. After lunch, those who want to go to Bumpass Hell can do the hike and those that aren’t up to it can make their way home. Bumpass Hell trail is a rewarding way to experience the park's largest hydrothermal (hot water) area. This moderate three mile round-trip hike leads to a boardwalk where you can listen to belching mud pots, watch as steam escapes from Big Boiler fumarole, and marvel at bubbling and boiling pools. The Trail: The trail is quite easy, though the altitude (8,000 feet) can make the trail seem moderately difficult. Hiking boots are recommended as the trail crosses generally rocky land with some tree cover, and without much change in elevation until the 100 foot drop into the thermally active basin. The active area can be seen (and smelt!) from far away - a wide basin filled with various steaming pools and unusual multi-colored soils, stained orange, brown, yellow and green by sulphur and other minerals. Together with the occasional white snow patches, the (usually) deep blue sky and the aquamarine waters, the spectacle is extremely beautiful and colourful. Rates start at $72.00, lower with AAA or AARP, etc. There are other hotels in the area, if you prefer a particular brand.